If you have read the story of “The Three Little Pigs”, you will definitely come to know what Big Bad Wolf game has on offer here. The developers Quickspin have tried incorporating the same motivation and stories with this title as well and have managed to come out with flying colours. The game happens to be one of their most successful offerings to date and is thoroughly loved by gamblers. Quickspin is known for making quirky and unique games, and over the years, this thought process of theirs has given them a lot of success. For gamblers unfamiliar with this particular fable, Big Bad Wolf slot tells the story of three pigs battling it out against a meaner wolf hell-bent on devouring them. The title is set in what looks like a straw house with the three little pigs in the background readying themselves for any kind of threat that may come their way. The background score also goes quite well with the overall theme of the game. The symbols within the title include the three pigs, beehives, the wolf and the moon. There are also different card symbols within the title including A, K, Q, J and 10. Scatters: The wolf is the scatter symbol in the title. Wilds: The beehive is the wild symbol in the production and can substitute for all the other symbols except for bonus and scatters. The three pig symbols also turn to wild after a player has won a certain amount of winning rounds. For every second win during the swooping reels feature, it manages to turn one of the pig symbols into wilds. This means on the second win the first pig will turn wild. On the fourth win, the second pig will turn wild, and on the 6th win, the third pig will turn wild. Free spins: Getting three or more of the wolf symbol will activate 10 free spins. Landing an additional three or more of these symbols will guarantee you another 10 free spins. The extra free spins come later in the Blowing down the house feature. Swooping reels: The swooping reels are a really interesting feature here. This means that after you have landed winning combinations, the winning symbol would disappear and then be replaced by new symbols. This will go until the player runs out of the winning symbols in the round. Blowing down the house feature: A gambler needs to collect the moon symbols to activate this feature. 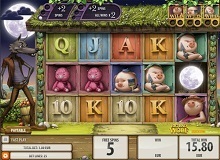 Getting three or more of the moon symbol will award you additional free spins which comes with a multiplier. 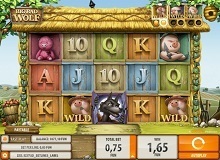 One can play Big Bad Wolf slot machine online from different devices at their disposal. This means one can use a desktop, mobile phones and even tablets to access this game. A good strategy to follow here is to be on the lookout for swooping reels as they can earn your maximum prizes after the wild combination. The presence of additional wilds and blowing down the house feature is another thing that you can use to your advantage. There doesn’t exist any other cheats or rules that you need to adhere here. Gamblers can play Big Bad Wolf for real money as well as for free on a number of casinos online Big Bad Wolf free. All you need to do is register in a portal and deposit money to start playing instantly. You ought to be careful with high rolling not to exhaust your balance. The game is a visual treat though that will be loved by gamblers of all ages.